Why is this product seem priced higher than other products in the supermarket and health stores? Unlike most commercial herbal supplements, YES™ Herbal is produced in small, limited quantities. The herbs have no pesticides and are certified organic or wild crafted. There is short world-wide supply of this level of herbal excellence. Surprisingly, when it comes to herbs, the exact place they are grown makes all the difference. YES™ personnel have spent close to a decade searching for the best, and we have found them for you. After harvest, the herbs are dried, and blended to our specific formula. Vegetable-based encapsulation completes the process. Just take one capsule a day. 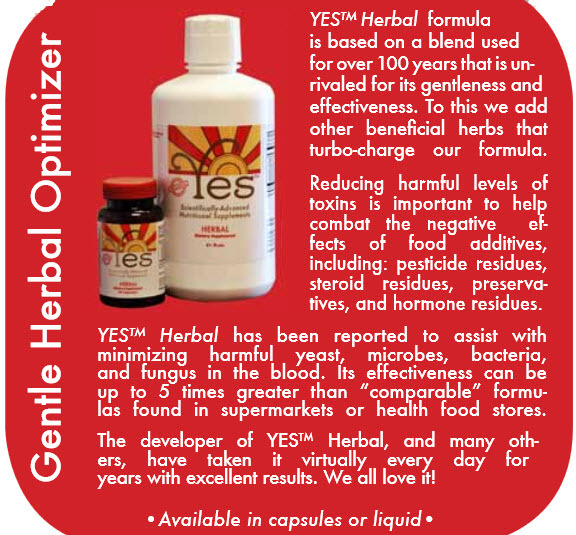 Natural Healing Tools brings you the specialized Herbal formula is extremely effective, so a little goes a long way! Don't settle for less than the best!